A dark day after over an inch of rain, Terri and Lee feed the replacement heifers before the Wagyu bulls arrive next month. Already dated, this photograph doesn’t show the green that has spread across the damp ground in the past three days. Temperatures forecast for the next ten days are in the mid-to-high-70s—perfect growing weather for our native grasses. Already, our first-calf heifers are leaving our flatter feeding grounds for the hillsides in search of green grass tall enough to bite, steep ground softer now to climb and graze a little dry feed with the new. Shorter days stuck in the low-50s, chilly mornings linger as both man and beast seem slower to get started, much of the pressure off after four days of rain and a thick germination of seed. Robbin and I are already talking firewood after we check the cows and calves on the Paregien Ranch, a Kubota load to augment the leftovers of last year’s stack, kept short to discourage rattlesnakes around the house. We’re ready, I think, to face whatever weather we get this winter, hoping always for well-timed rains. 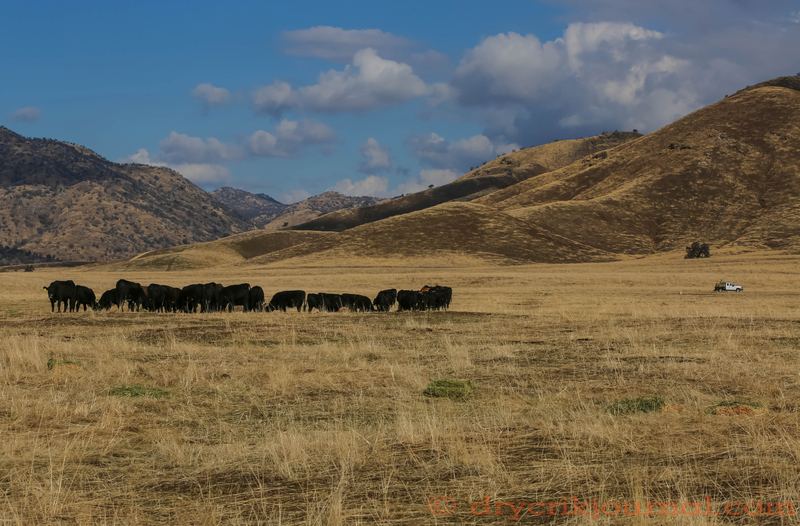 This entry was posted in Photographs, Ranch Journal and tagged cattle, grass, photography, rain, weather. Bookmark the permalink. There’s something both primitive and cozy about stocking up on firewood, John. Praying that you get the timely rains you need.